1. 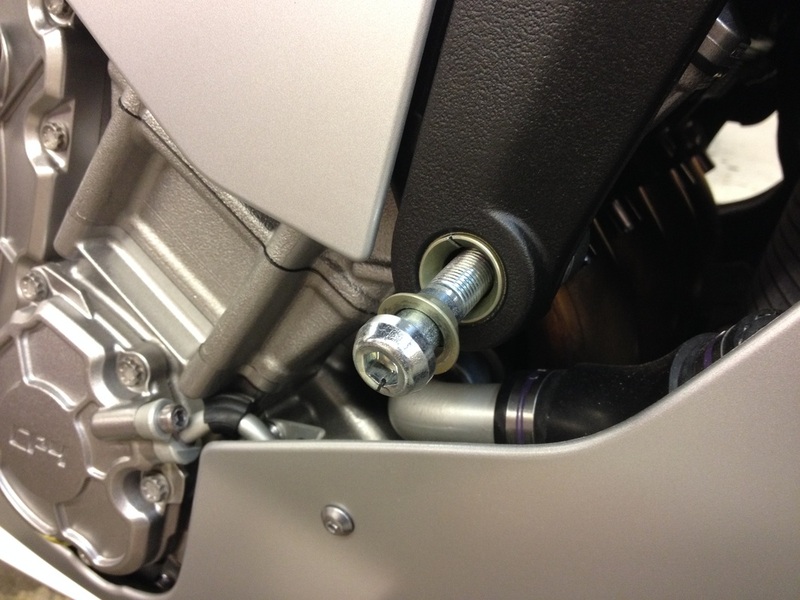 Start on the right side of the bike (do not loosen both sides at once) by removing the engine mount screw. This is the screw that goes through the frame and into the side of the engine- it is visible through the opening in the side fairing. The screw uses the 8mm hex driver to loosen. The screw is circled in red in the photo below (figure A). Caution! Do not remove the three piece tapered spacer set (figure B) that is beneath the right side factory mounting screw. The spacers will normally stay positioned correctly once the factory screw is loosened and removed but in some cases the outer cone-shaped spacer will fall out of place. See figure B for a picture of the spacers. 2. Identify the right slider- it is the shorter slider. Lightly lubricate the supplied screw and install the frame slider. Do not use thread locker. Any type of automotive grease or oil is recommended. 3. Our frame slider screw is driven by a 10mm hex driver. Do not use any type of impact wrench to install the slider screw. 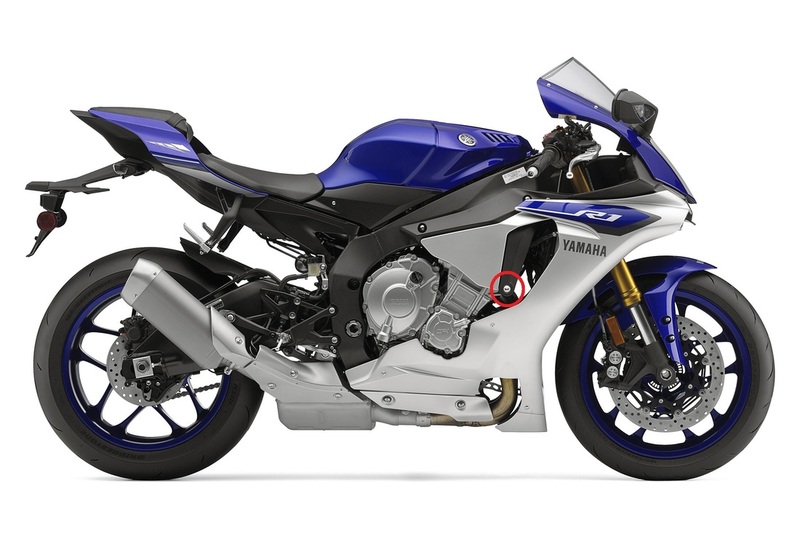 Tighten the screw to the factory torque specification. 4. Make sure the right side is tight before starting on the left side. 5. On the left side, remove the engine mount screw (figure C) using the 10mm hex driver and install the longer frame slider using the same method and torque as the right side. The spacer set is not a factory part of the left side mount. screw (40mm) that was supplied with the fork sliders set. 2. Attach the slider with the extended base to the aluminum fork slider rod. 3. After tightening, insert rod/slider assembly into the right side of the axle. will strip if too much force is applied to the screws when tightening. The fork slider assembly should not have any lateral movement once tightened. 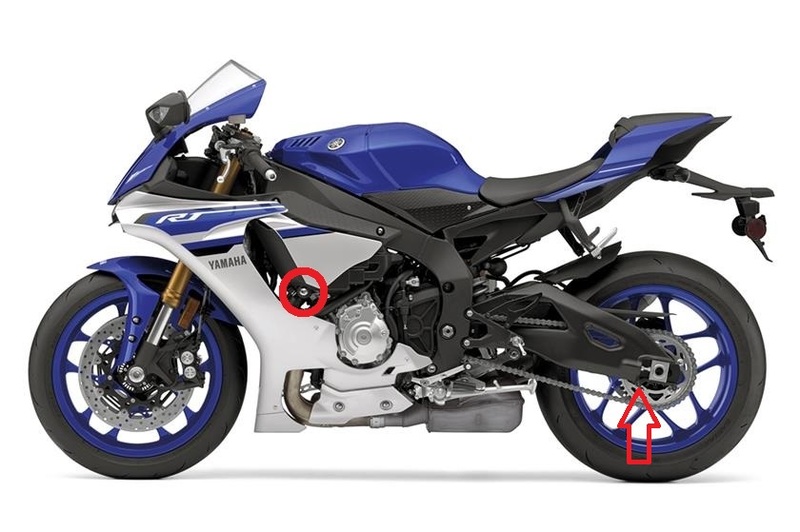 The spools mount to the swingarm- the arrow in figure C points to the mounting point. 1. Apply a small amount of medium (blue) thread locking compound to each spool screw. 2. Tighten with light torque with the 6mm Allen Key. If one side is damaged in a crash or drop, we offer single side replacements, instead of buying a complete set. Figure B- Do not discard/omit these factory spacers.